Have You Met Serena Williams' 'Granddaughter,' Qai Qai? 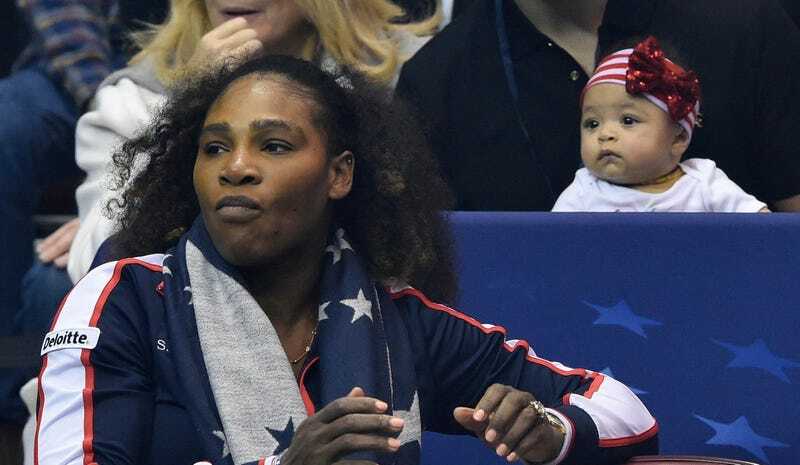 Serena Williams and her daughter Alexis Olympia, center, watch the action during the first round of the 2018 Fed Cup on February 10, 2018 in Asheville, North Carolina. Just when we thought the relationship between Serena Williams and beloved daughter Alexis Olympia couldn’t get any cuter, the Olympian introduced us to her “granddaughter,” Qai Qai,” (pronounced “Quay-Quay”) a bald, brown babydoll whose clothing budget is likely larger than ours (she even has a US Open-ready lavender tutu). But in all seriousness, there’s another reason why Qai Qai’s presence is significant in the Williams-Ohanian household, and it dates back to the 1940s “doll test” that gauged implicit bias and self-esteem among black children. Conducted by psychologists Kenneth Bancroft Clark and Mamie Phipps Clark, the doll test used baby dolls of different colors—some of which bore a strong resemblance to Qai Qai—to gauge the preferences of black children between the ages of 3 and 7. At the time, most children tested preferred and assigned positive characteristics to the white dolls. The Doll Test for Racial Self-Hate: Did It Ever Make Sense? While the relevance and accuracy of the test has come under debate in the years since (and thankfully, more recent results indicate that black children gravitate more towards doll that look like them), what is less disputed is that representation matters, which is why the Williams-Ohanian’s choice to introduce their biracial daughter to a black doll as one of her first toys—and her purported love for said toy—is both significant and the most natural thing in the world. While much has been made of Williams teaching her daughter French, and her husband, Alexis Ohanian, is of Armenian descent, the parents are clear of the fact that they want their daughter to stand strong in her identity as a black woman, as Williams told Essence in August. If for now that begins with one seemingly indestructible doll, we’re here for it.